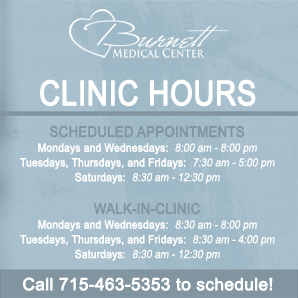 Burnett Medical Center Clinic is pleased to offer our patients the following services: Physicals (Including Well-Child Exams, Pre-operative, DOT, etc. 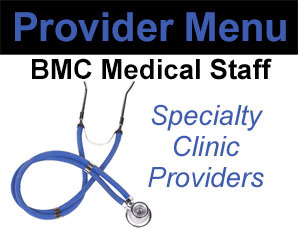 ), obstetrical exams, health status assessments, diagnosis and treatment of common, acute and chronic health conditions, immunizations, family planning, diabetic education, women's health, colposcopy procedures, fracture care, vasectomies, routine laboratory testing, EKG's, and Holter monitoring. Additionally, the clinic laboratory is a certified collection site for urine drug screening. 8:00 AM - 8:00 PM Mon., Wed.
7:30 AM - 5:00 PM Tue., Thu., Fri.
8:30 AM - 12:30 PM Sat. 8:30 AM - 8:00 PM Mon., Wed.
8:30 AM - 4:00 PM Tue., Thu., Fri. Call (715) 463-5317 or (866) 463-5317 to check availability. *In the event Walk-In is no longer available late in the day, the BMC Emergency Department is open 24 hours.